A fine example of a substantially extended and stylishly refurbished, impressive, detached dormer style bungalow. Being set back from the road and occupying a large re-landscaped plot whilst ideally located close to the town centre high street. Benefiting from replacement double glazing, newly laid floor coverings throughout and having deceptively spacious, gas fired centrally heated family living accommodation briefly comprises: Open plan galleried reception hall/dining area, lounge with log burning stove, bedroom four with en-suite cloakroom, bedroom three/study, comprehensive bespoke fitted breakfast/kitchen, luxury family shower room, guest lounge/kitchen, guest bedroom and luxury guest shower room. First floor having a galleried landing, master bedroom with luxury en-suite bathroom, double bedroom two with luxury en-suite bathroom and ample driveway parking. EPC rating TBC. Alcester is a picturesque and historic market town, which benefits from a variety of local shops, sporting, social and cultural facilities and is ideally located for commuting to the larger towns of Stratford-upon-Avon, Redditch, Evesham and the NEC and Birmingham airport together with easy access to the M40, M42 and M5/M6 motorway network. The approach to the property enjoys a raised retaining brick wall frontage to a part block paved driveway entrance onto a chipped gravel sweeping driveway providing ample parking space. A feature block paved footway leading to an attractive part feature opaque panelled double glazed front entrance door with automatic soffit spotlights and giving access into a most impressive open plan reception galleried hallway/dining area. Enjoying a high pitched ceiling slope in part over a delightful bespoke fitted open staircase with inset glazed balustrade rising to the first floor galleried landing. Upvc double glazed side door window to the front elevation and double glazed folding doors overlooking and giving access out to the generous, re-landscaped rear garden. Ceiling spotlights, two wall uplighters, wall mounted central heating room thermostat, double radiator, feature floor tiling continuing through feature hardwood door giving access into the luxury downstairs family shower room and archway off to the impressive bespoke fitted breakfast/kitchen. Feature hardwood doors off to downstairs bedroom four with cloakroom, downstairs bedroom three/study and archway providing access into the generous lounge. Having a contemporary style wall mounted log burning stove with feature tiled back over a feature slate hearth. Ceiling spotlights, double radiator and double glazed folding doors overlooking and giving access out to the generous, re-landscaped rear garden. With ceiling spotlights, single radiator and upvc double glazed window enjoying a pleasant outlook to the front elevation. With ceiling spotlights, single radiator and upvc double glazed window enjoying a pleasant outlook to the front elevation. Feature hardwood door giving access into the storage cupboard housing the wall mounted gas fired combination condensing boiler and central heating programmer. Feature hardwood door providing access into the en-suite cloakroom. Having a matching contemporary style white suite comprising close coupled push button WC, vanity unit wash hand basin with mixer tap, self draining feature floor tiled walk in shower enclosure, glazed shower screen and wall mounted Deluge body spray mixer shower unit. Feature wall tiling to splash prone areas, ceiling spotlights, ceiling extractor fan and wall mounted chrome effect heated towel rail ladder radiator. Having a comprehensive range of matching eye and base level bespoke fitted units to include: feature marble work surfaces with splashback to match, substantial island unit incorporating breakfast bar and inset bowl and a half sink unit with mixer tap, concealed pop-up plug sockets. Belling gas cooker range with feature bridging unit incorporating illuminated extractor unit over. Integrated dishwasher, integrated washing machine, two deep drawer base units, two tall double storage units with central recess housing an American style fridge freezer unit with wine bottle rack over. Ceiling spotlights, tall contemporary style radiator, feature floor tiling, substantial double glazed lantern rooflight and double glazed folding doors overlooking and giving access out to the generous, re-landscaped rear garden. Feature hardwood door providing access into the guest lounge/kitchen. Having a range of matching eye and base level contemporary style units to include: feature work surface with splashback to match, inset single bowl sink unit with mixer tap, inset dual ring electric hob and built in electric oven with storage unit above and below. Ceiling spotlights, ceiling extractor fan, feature wood effect laminate flooring, double radiator and double glazed sliding patio door overlooking and giving access out to the generous re-landscaped rear garden. Feature hardwood door providing access into the guest entrance hallway. With ceiling spotlights, single radiator, built in storage cupboard housing both the gas & electric meters, feature part opaque diamond double glazed entrance door giving access out to the front elevation and feature hardwood doors off to the ‘occasional’ downstairs guest bedroom and downstairs guest luxury shower room. With ceiling spotlights and single radiator. Having a matching contemporary style white suite comprising low flush push button WC, vanity unit wash hand basin with mixer tap, walk in shower enclosure with glazed shower screen and wall mounted Deluge/body spray mixer shower unit. Feature splashback wall tiling in part, feature floor tiling with skirting to match, chrome effect heated towel rail ladder radiator, ceiling spotlights and ceiling extractor fan. With ceiling loft hatch, ceiling spotlights, inset glazed banister and feature hardwood doors off to both the master bedroom and double bedroom two with luxury en-suite bathrooms. Boasting double glazed French double doors with matching side door windows incorporating a delightful Juliet style balcony enjoying a pleasant outlook to the rear elevation. Ceiling spotlights, two double radiators, book/display shelving recess, two eaves storage cupboard access doors and feature hardwood door providing access into the luxury en-suite bathroom. Having a matching contemporary style white suite comprising low flush push button WC, pedestal wash hand basin with mixer tap, bath tub with freestanding mixer tap/integral shower hose attachment and walk in shower enclosure with glazed shower screen and wall mounted Deluge/body spray mixer shower unit. Feature splashback wall tiling in part, feature floor tiling with skirting to match, ceiling spotlights, ceiling extractor fan, shelf recess, chrome effect heated towel ladder radiator and upvc double glazed window enjoying a pleasant outlook to the rear elevation. Boasting double glazed French double doors with matching side door windows incorporating a delightful Juliet style balcony enjoying a pleasant outlook to the rear elevation. Ceiling spotlights, two double radiators, two built in single wardrobes with storage cupboards over and low level eaves access door. Door giving access into the luxury en-suite bathroom. Enjoying a low vaulted ceiling incorporating ceiling spotlights, ceiling extractor fan and having a matching contemporary style white suite comprising close coupled push button WC, pedestal wash hand basin with mixer tap and period style feature claw feet double ended bath with wall mounted mixer tap over. Feature wall tiling in part, feature floor tiling with skirting to match and chrome effect heated towel rail ladder radiator. 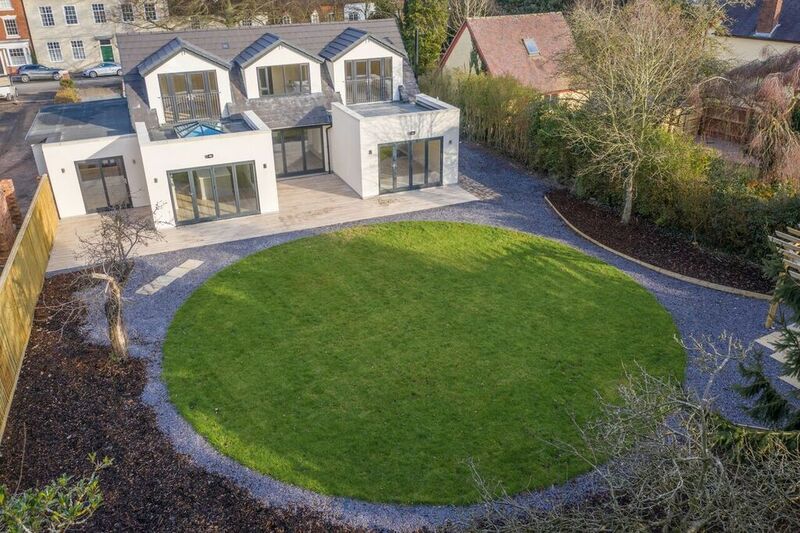 Boasting a substantial mature tree feature to a shaped lawned garden adjoining a chipped gravel sweeping driveway providing ample parking space. Gated side entrance providing access to the generous, re-landscaped rear garden. There is a block paved side footway with outside cold water tap, an impressive feature tiled patio boasting an array of outside lighting, circular laid to lawn garden with extensive slate chipped border footpath surround, wood bark garden borders complimented with a variety of maturing tree features.